We’ve been enjoying milder weather here in central MA this first week in December, with temps reaching a balmy 50 degrees on some days. But yesterday a sharp, cold wind blew in from up north and swept all of the mild away. We may even get some snow flurries tonight. I’ve been cozying up to a blazing fire in the fireplace with a steaming cuppa. This morning I’m sipping a Milky Oolong from Taiwan. Grown in the Dong Ding (Tung Ting) mountain area in Nantou county, the tea is harvested from March through December. Dong Ding mountain, perpetually shrouded in mist and fog, has an elevation of over 2400 feet and means “frozen summit” or “ice peak”. 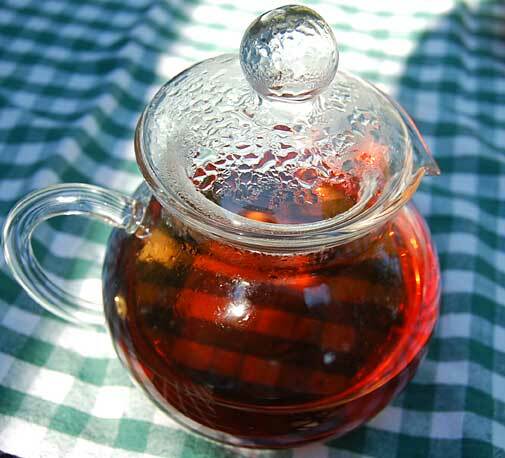 It’s one of the best known tea producing areas on the island. First, the leaves are plucked from a special varietal of tea plant with large leaves. Then they are withered and allowed to oxidize in carefully controlled air conditioned rooms. 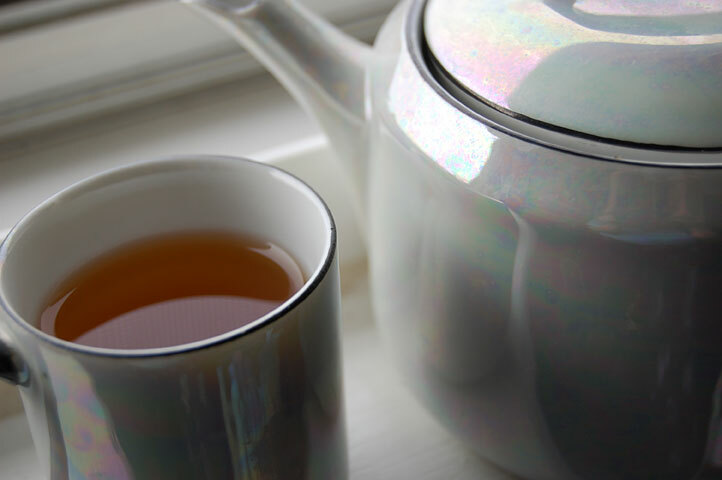 Oolong teas are not as oxidized (fermented) as black teas so after a shorter time, they are steamed with high heat to stop that oxidation process. This Oolong is more on the greener side so its oxidation time is less than other darker Oolongs. The leaves have been tossed during processing so they are all curled up. I enjoyed watching the leaves unfurl during the 3 minute steep in 180 degree F water. Milky Oolong has such a unique taste that many stories have evolved to explain its unusual flavor. My favorite story is that the tea’s flavor came about as the result of a sudden shift in temperature during harvest that is an extremely rare occurrence. The first time this shift occurred was centuries ago when the moon fell in love with a comet passing through the night sky. The comet, passed by, burned out and vanished. The moon, in her great sorrow, caused a great wind to blow through the hills and valleys bringing about a quick drop in temperature. The next morning, local tea pluckers went out to collect their fresh leaves. 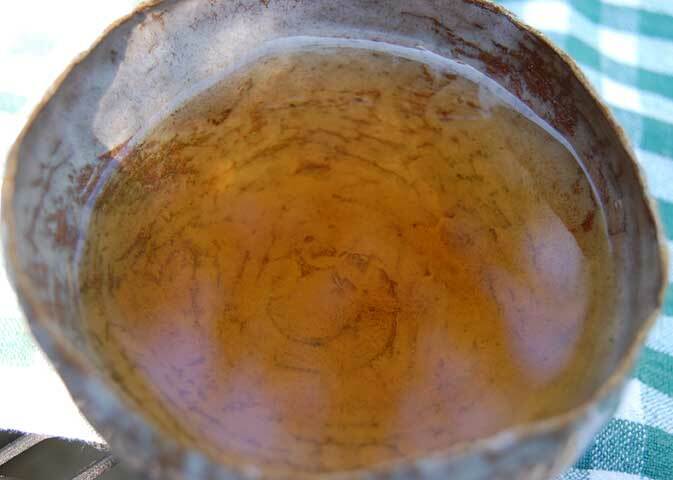 To their surprise, when the tea was processed it had developed an amazing milky character, which was attributed to the motherly character of the old moon. 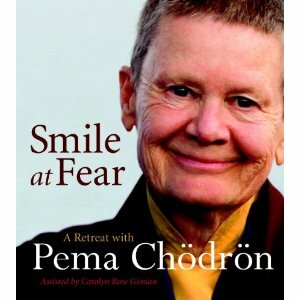 I love that story and it reminds me of what we’ve been experiencing here recently with the change in the weather. The aroma of this tea is floral with a rich hint of cream. 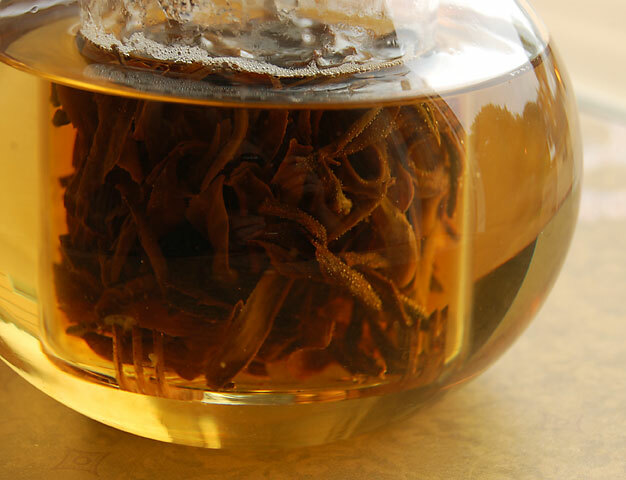 Its flavor, also quite floral, reminds me very much of a Spring Dragon or Jade Oolong. It conjures up images of a blooming spring garden, ripe with its heady fragrance. There is also a buttery creaminess to the taste as well which gives a soft, silky feeling in my mouth. This truly is a very special tea. This weekend is a good one for knitting and crocheting holiday gifts by the fire, a hot cup of tea by my side. It is a gorgeous late summer morning here in New England with brilliant sunshine and low humidity. A soft breeze ruffles the treetops as I sit out on my back deck and listen to them sigh. A good morning for sitting out in nature and being still. Several weeks ago I reviewed a tea called Heavy Baked Tie-Guan-Yin Oolong and I discovered that I had never reviewed a Jade Oolong, a tea upon which that particular tea is based. Well, this morning I brewed some up in my favorite glass teapot. Oolongs are allowed to oxidize at varying times thus creating some that are more towards green tea and some that are much darker than that. 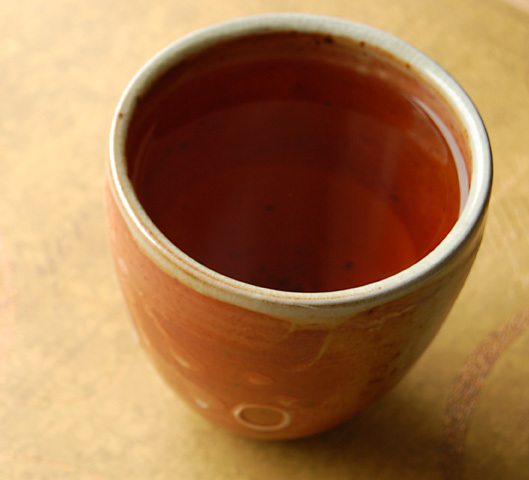 A Jade Oolong is only oxidized for a short amount of time, about 18%. As you can see, this creates a tea that is very pale yellow. A luscious flowery aroma greets me as I pour my first cup. 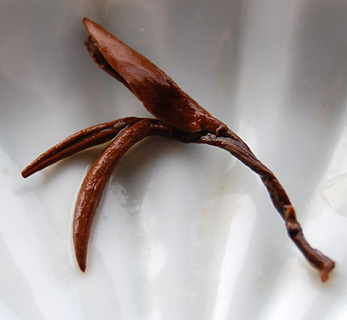 During processing, the leaves are rolled into curly shapes that gently release during the steeping. Sweet and rich, the liquor is buttery soft with a pleasing lilac note. I steeped the leaves in 180 degree water for 3 minutes. 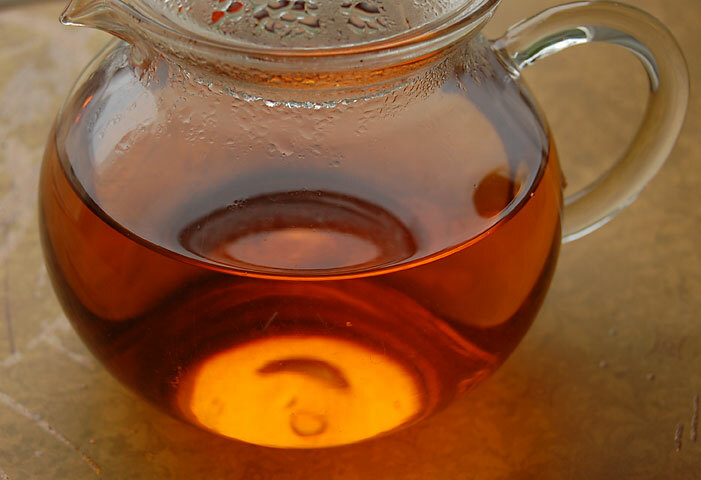 If you want to try multiple steepings, shorten your steeping times. My youngest son leaves for Basic Training with the Air Force in 2 days. He’s been trying to go early all summer but it didn’t happen. It seems his military training began earlier with this first exercise in patience. I’m so proud of him. Today we are having a big family dinner to send him off with good wishes and love. Between that and a little soreness in my right wrist, my freeform bracelet will also have to wait patiently for my return. What a marvelous day – warm, not too humid with brilliant sunshine. Here in New England this past week, we’ve had some wild weather, including a couple of tornadoes that touched down in New Hampshire and Massachusetts. We experienced vivid lightning, crashing thunder and torrential downpours like I saw when I traveled to the Hawaiian rainforest. On our walk last night, we collected quite a few branches that had been knocked down. They’ll make great kindling for our fireplace once they’re dried out and seasoned. With all of this fire energy flying about, I decided to try a new type of tea for me – a smoky tea. I know that there are a lot of Lapsang Souchong fans out there but, alas, I am not one of them. That said, this tea has always intrigued me and I keep searching for one that I will enjoy. At my company, it is one of our best selling types of tea. I’m not reviewing a Lapsang this morning. Not yet. I have one in mind for an August review. This morning I am sipping a Formosa Oolong called Heavy-Baked Tie-Guan-Yin. 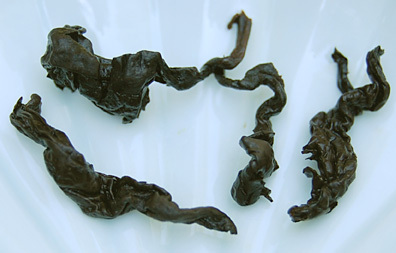 The full leaf is first processed as a Jade Oolong which is a slightly oxidized leaf. 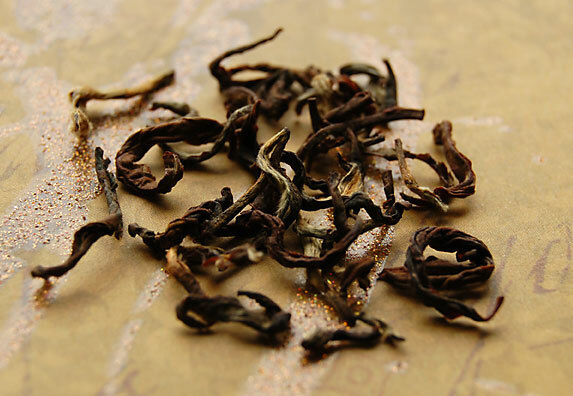 Still considered an Oolong tea, it is much more green in character than other Oolongs. This is because the leaf is allowed to oxidize only a little bit, approximately 10%, give or take. 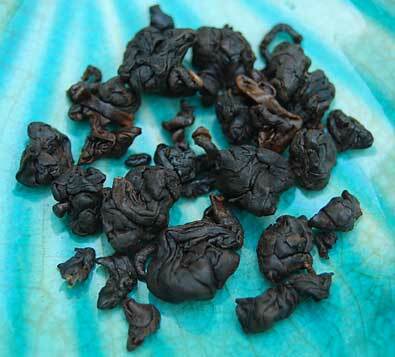 Some other Oolongs are oxidized 40-50%, giving them a much darker flavor and fuller body. I looked back on my tea archives and was surprised to discover that I haven’t reviewed a Jade Oolong yet. I’ll do that in August, too. I did review a Spring Dragon Oolong, another “greener” Oolong. Once this tea is processed as a Jade Oolong, it is then roasted to give it a much different flavor. As you can see, the leaf is so very dark. 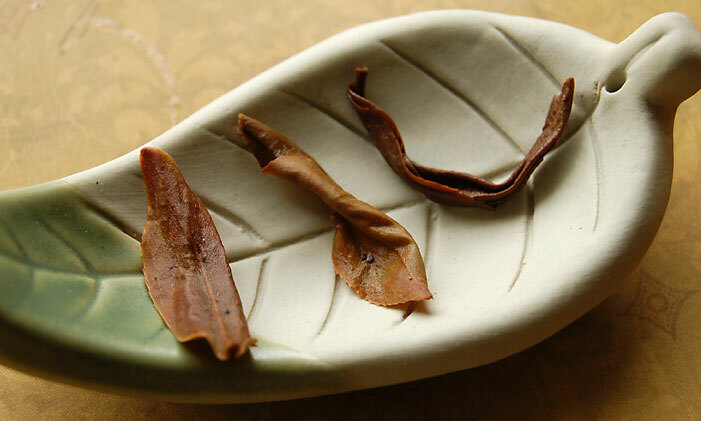 In the processing, the leaf rolls up into little bundles which then release their shape a little during the steeping. I steeped the leaves for 4 minutes in 190 degree F filtered water. The liquor is a deep reddish brown with a smoky aroma that has hints of tobacco. The taste is sweet and smoky but not overly so. For me, the smokiness is at just the right level. The full-bodied taste would probably stand up well to milk and sweetener. I am enjoying it plain. My youngest son is getting married! 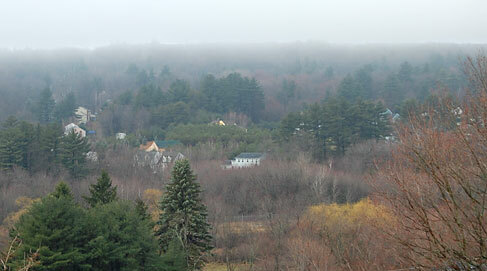 As I gaze out my window on this cool rainy spring day, I see a mist has settled gently along the treetops. This morning I am getting ready to go visit Greyhound Rescue in Mendon, MA. They’re having their annual Spring Yard Sale soon and I have plenty to donate from my cleaning and purging. As I get ready, I’m sipping a cup of Formosa Fancy Oolong Imperial. 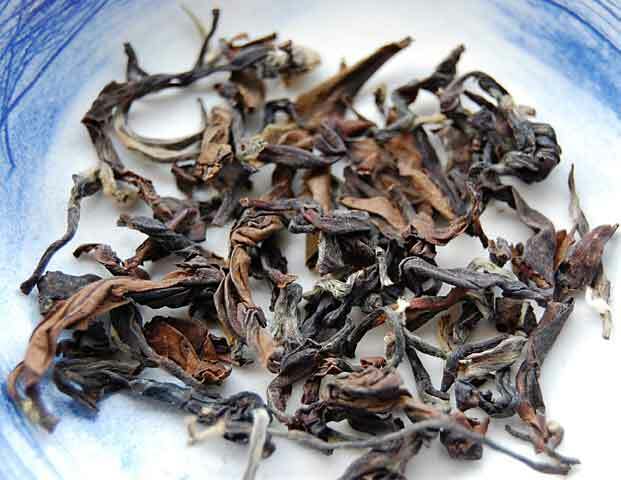 It is an Oolong with a higher level of oxidation which means the leaves were allowed to turn darker. The photo above is a beautiful example of a “fine plucking” (new leaves). Its shape reminds me of a Bird of Paradise flower. I steeped the leaves for 5 minutes in water between 180-190 degrees F. The liquor is a deep amber color with a sweet aroma. The flavor is nutty and peachy and lingers in my mouth. Time to move more stuff!